It's easy to get comfortable with our reading and stick to what we know. And I say this staring at a shelf filled with thrillers (not all of them my own...), comedy material and books about the craft of writing. The world - and the internet we tend to see it through - is a big and interesting place though, and if you turn off your literary sat-nav you can sometimes find a gem. Recently, a US author, Peter Davidson, contacted me about a book he thought I'd appreciate. Turns out he was right. Marital Advice to my Grandson, Joel would not have appeared on my radar but I'm glad it has. It combines observational humour with personal anecdotes and has a ring of truth about it, not least because Peter genuinely wrote this book for his grandson, who in turn genuinely got married to Abby (see photo below). Peter's book doesn't take itself too seriously, but it has a lot to say about man's evolution, and why it would be a great idea! Guys, relax. He has it covered. 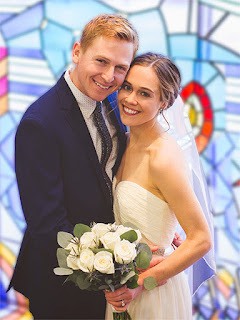 When Peter Davidson's grandson, Joel, got engaged, Davidson decided to jot down a few words of marital wisdom for him, based on his vast experience as a husband. Davidson wrote and wrote and wrote until the “few words” became an epistle. Then he thought, why share this wisdom with only one person when he could share it with the whole world. So, Davidson started a blog, listing new marital advice every week. As the popularity of the blog grew, people suggested that the material should be turned into a book. 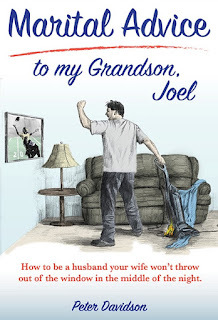 The result is Marital Advice to my Grandson, Joel. The book reads like a long letter from a grandfather to his grandson, filled with homespun marital advice and philosophies, true stories, and large doses of humor. The reader will have the feeling of peeking over Davidson's shoulder as he pens his wisdom or of eavesdropping in on a conversation between grandfather and grandson. Advice to grandson Joel, and to any man, includes: make sure that you buy a roll of electrical tape before you volunteer to do the vacuuming, and why, how to deal with your wife's steely-eyed, clinched-jaw scowl, known as “The Look,” the warning that your mouth will get you into a whole lot more trouble than your Willy ever will, and how to create the world's most powerful anniversary card for your wife. Virtually all of the material in the book is presented in the form of upbeat stories, scenarios, and examples. This is definitely not the type of advice that you'll find in a textbook on marriage or in a book on marital relations written by some psychiatrist. This is the real stuff for real people. 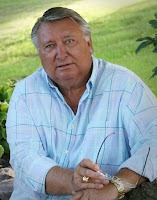 The book is available at amazon.com, barnseandnoble.com and at book stores. And just to prove there was - and is - a happy couple, here's that wedding photo I promised. I’ve made no secret of the fact that Raymond Chandler’s writing is one of the inspirations for my Thomas Bladen spy thrillers, but I also owe a huge debt to cinema. It’s my great pleasure now to introduce you to a back catalogue of films that remain classics of the spy / thriller genre. Many of them are derived from novels but for consistency I will only reference the films and I’ve added the IMDB links so you can read about the plot in more detail. I hope you find some old favourites here, as well as some ‘new’ classics to add to your own list. We’ll come back to Raymond Chandler in a bit. First and foremost, I have to pay tribute to The 39 Steps, a tale of a man unwittingly drawn into a murderous conspiracy, who goes on the run to prove his innocence. I favour the 1935 version with Robert Donat and Madeleine Carroll, as well as a brilliant BBC version from 2008 (which includes elements from the novel that were left out of every other film). How much do I love The 39 Steps? Well, in Standpoint, Thomas watches the 1935 version with Miranda and comments on how Hitchcock changed the story from the novel. There’s also a homage to one of the film’s plot devices in Line of Sight, my follow-up to Standpoint. I put North by Northwest (1959) alongside The 39 Steps as another great example of a mistaken identity driving the plot forward. How do you win through when you don’t know what you’re supposed to know? I think it helps to have other people looking out for you from time to time. The films Farewell My Lovely (1944), TheBig Sleep (1946) and The Long Goodbye (1973) allow Raymond Chandler’s world-weary private detective, Philip Marlowe, to fill the screen; much like Bogart’s performance as Sam Spade in the Dashiell Hammett co-scripted adaptation of The Maltese Falcon. My original intention had been to write Thomas Bladen as a detective, only he arrived pretty much fully formed and had his own opinions about what he did for a living. What I love most about this batch of films is the dialogue and the characterisation. The plots are well-crafted but to me they are secondary. The ‘hero’ is flawed and his attitude is often more hindrance than help as he battles relentlessly against the tide. These films are gritty, sometimes sleazy and show the underbelly of society. Yet somehow, almost miraculously, the hero emerges with most of his honour intact. My fondness for this genre led to the creation of Leon Thurston, a West Indian private detective who plies his trade from an old minicab office in Dalston. East London. While we’re on the subject of Chandler, make time for The Blue Dahlia (1947) – it’s an intriguing whodunit that apparently involved a controversial rewritten ending…but you can research that for yourself! Like Alan Ladd’s Johnny Morrison, Thomas Bladen is a little out of steps with the world around him, but the right woman makes all the difference. Spies yet? Well, almost. Vicious Circle (1957) finds a humble doctor (humble but with a cravat!) drawn into a deadly game of blackmail and intrigue that leads him questioning who is out to get him – and why? I’d put this one in the same category as The Man Who Knew Too Much (1934) and also (1956). Ordinary people in extraordinary times, who dig deep when they find themselves pawns in a much bigger game – much like Robert Hannay in The 39 Steps. Both The Conversation (1974) and Enemy of the State (1998) tackle surveillance, paranoia and ethics, along with the perennial question of who watches the watchers. It is perennial too, as that phrase is as old as the Romans. In Thomas Bladen’s world, a simple surveillance job often turns out to be far more complicated and it doesn’t pay to ask too many questions (not that it stops him). The observer may seem impartial but they cannot deny there are consequences to their work. Three Days of the Condor (1975) pits one man against the ‘organisation’, by trying to stay one step ahead of everyone, in order to get to the truth and hold people in power accountable. By book five, Flashpoint, Thomas has learned that justice can take many forms and sometimes even a bitter compromise is the best option. The Third Man (1949) involves a mystery, a disappearing act with a difference and a conspiracy – how do you find out the truth when everyone is telling you something different? Its cunning and amoral titular character (compelling played by Orson Welles) dominates the film despite not being the main role. This group of films demonstrate another element that I wanted to bring to my books: unresolved endings. The moviegoer is left wondering what could happen afterwards. I hope you’ll make time to watch all these films, even if you’ve seen them before. When not watching classic cinema, I write Thomas Bladen spy thrillers - intrigue, action and sardonic humour. 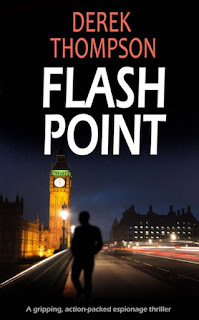 After London suffers a coordinated terror attack, Thomas Bladen questions everything – his future with Miranda, his Surveillance Support Unit job and even his clandestine role as a Spy Chaser. But his troubles are just beginning. When the Unit comes under MI5’s control and two senior SSU staff disappear, his search for answers is blocked at every turn. A missing handgun and the reappearance of old adversaries forces him into uneasy alliances and hard choices. - Could there be a double agent in their latest assignment? - What is behind the rift between government departments? - And what if he has got it wrong this time? Thomas must face his deepest fears and what he discovers could change the rules forever.